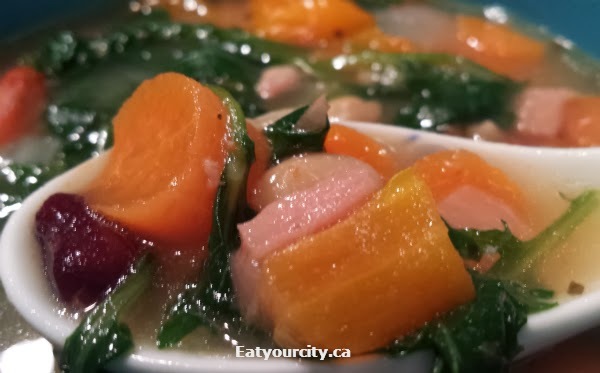 Eat Your City: Easy peasy ham or bacon, kale, beans and tomato soup recipe! 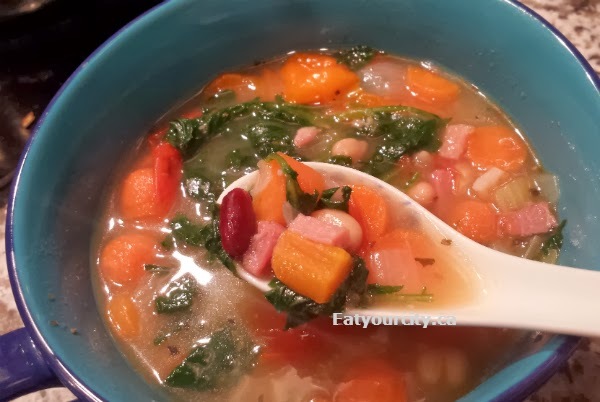 Easy peasy ham or bacon, kale, beans and tomato soup recipe! Posted by This recipe is pretty versatile in that you can more or less toss anything you happen to have kicking around in your pantry or fridge and it'll still be tasty. You'll need a can of beans, some type of protein/meat, either spinach or kale and tomatos (fresh or canned) if you have them kicking around and fresh or dried herbs if you feel like it... once you chuck everything in, let it simmer for 20-30min, serve it with a nice fresh loaf of bread and viola, you go yourself a hearty, healthy meal. If you're really wanting to make everything from scratch, you can use scratch chicken/turkey broth, and soak whatever beans you're planning to use for a few hours prior to popping them in. If you're also smoking/curing the ham/bacon... you're making life just waaaay to hard on yourself! Sit back, relax and have a beer while the soup simmers and scents your house with yumminess! My boyfriend hates beans, but loves this soup! And since you can tweak the ingredients around quite a bit, this soup can be made gluten free and meat free for those that like it that way. *optional: you can add in 1 cup of pasta (regular/whole wheat/rice) and simmer in the last 10min if you want a super dooper hearty soup! 1) With the stove on medium high, add oil or butter to pot, and cook the chili flakes, garlic, onion, celery and carrots for a minute or two until its all nice and fragrant. If using bacon/pancetta, you can brown them first, fish them out, drain all the oil and cut out the butter/oil if you don't wipe your pot to cook the veges and aromatics in. 2) Gently add (so you don't splash yourself) the broth to your pot (it should reach 1/2 way to max 3/4 way up or you'll run out of room for the rest of the ingredients... and crank it to high to boil. 4) A few minutes before serving, drop spinach/kale into the pot and let simmer for 2 min to soften. Adjust seasoning with salt and pepper, and ladle this easy peasy hearty soup out with fresh bread or pair with sandwiches. Enjoy! 1) With the crockpot or slowcooker on high, add oil or butter to pot, and cook the chili flakes, garlic, onion, celery and carrots for several minutes until its all nice and fragrant. If using bacon/pancetta, you can brown them first, fish them out, drain all the oil and cut out the butter/oil if you don't wipe your pot to cook the veges and aromatics in. 2) Gently add (so you don't splash yourself) the broth to your crock pot/slow cooker (it should reach 1/2 way to max 3/4 way up or you'll run out of room for the rest of the ingredients. 3) Give the canned beans a good rinse and drain so your soup won't turn out crazy salty. Add beans, tomatoes, bay leaf, herbs and ham/protein choice to the pot. (You should have everything but the spinach/kale and salt and pepper in the pot). Pop on the lid and turn down to low and cook for 6-8 hours, if you cook it on high 3-4hours. 4) A few minutes before serving, crank it bakc up to high, drop spinach/kale into the crock pot/slow cooker and let simmer for 5 min to soften. Adjust seasoning with salt and pepper, and ladle this easy peasy hearty soup out with fresh bread or pair with sandwiches. Enjoy!